Corrugated tubes are mostly used for waste water disposal and extrusion of fluids from houses, factories and also in many commercial applications. These longitudinally arranged co-axial pipes provide reliable and flexible cabling with high mechanical strength. They are easy to install and manage even at small bends without any loss on its physical architecture. Corrugated tubes vary in sizes and available for all kinds of application, you have seen small corrugated pipes used as drain pipe to carry run off from shallow trough below the eaves of a house. Larger pipes are mostly installed in underground channel carrying water under a road or bridges. The corrugation of the pipe is determined by the height of the ridges on its surface, more ridges per unit area results in more flexibility of pipe. These tubes are made up of various type of polymer like PTFE, FEP, PFA and ETFE, and also by steel and other metal, such material operates at very high temperature and corrosive environment. The tube features low coefficient of friction, anti-stick properties and corrosion and chemical resistance property. The pipes are tested under various pressure ranges so that they can perform better in application that require pipe to be buried and bear the compression provide by soil. The coating or lining is done inside the pipe which improves flow of fluid through the pipe. Corrugated steel pipe also requires the measurement of electrical resistance and pH of soil for underground application. The metallic corrugated tube is generally coated by the process that include zinc-galvanizing, aluminizing and by polymer or asphalt. However, plastic corrugate pipe are prefer over metallic pipe as they have high tolerance for pH value and has no conductivity. These pipes are manufactured in long length and delivers in bundle or roles to the installation site; you can easily cut off the section or join the pieces according to your requirements. In addition to the corrugated tubing design the manufactures also offers extensive custom made extrusions capabilities in the pipe. According to your application requirement the custom extrusions of high tolerance, custom reinforcement, in line cutting, solid colors and with special resins compound are created. 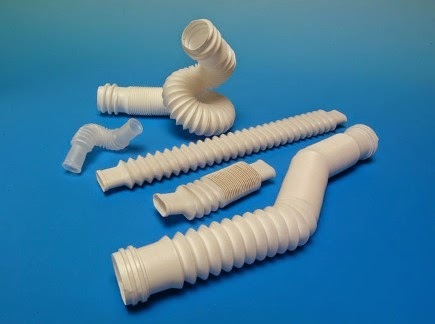 The design of the extrusion determines the shape and size of the pipe required to fit exactly in the space. The factors that affect the custom made extrusions are the wall thickness and corner. To improve the extrudability the thickness of wall should be uniform and the corners should be rounded to lay down the tube properly. Since corrugated shaped pipe are easy to bend and cut down in to small section so they can be easily incorporated in the design which demand sharp internal angles to enclose the shape. The custom extrusion can be made up of variety of materials such as Acrylic, Polycarbonate, Nylon, all type of polyethylene, PVDF, synthetic rubbers, thermoplastic Elastomers and other plastic and metals. To fine tune a plastic material with all other sections of extrusions compounding is necessary. Compounding permits the designer to enhance the specific areas of plastic performance by blending additives into it. This make the part work last longer and provide benefits such as low temperature flexibility, resistance to fungus growth, improved purity, dielectric, elasticity and conductivity property, UV and gamma stabilization. Custom made extrusion manufacturing process has ability to create very complex cross section with the brittle material by following any type of hot, cold and warm extrusion technique. The custom extrusion takes shape and features to reduce weight, simplify assembly, enhance functionality and minimize finishing cost.